This blog post is a part of our ongoing guest series, Seniors Stories. 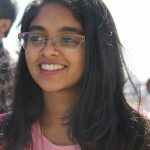 We asked high school seniors who recently went through the college application process to share their experiences and achievements that earned them admittance at the top colleges in the U.S..
Meenu Bhooshanan is a senior from Alabama and has been accepted to Duke University, Washington University in St. Louis, Georgetown University, Tufts University, Wellesley College, George Washington University, University of Alabama, Washington and Lee University, University of Alabama Huntsville, American University, and Embry-Riddle Aeronautical University. Meenu will be attending Washington University in St. Louis and majoring in International and Area Studies and Arabic in the fall. In high school, there are two types of students: people who have known what they want to do since birth, almost like a divine mandate, and people who are decidedly undecided. For me, my career goals have evolved over the years. In elementary school, watching and reading about dinosaurs made me interested in paleontology. In middle school, after learning about the judicial system in my civics class, I wanted to be a lawyer. When I got to high school, and the prospect of college and becoming an adult dawned on me, I balked. For the first two years, I had absolutely no idea what I wanted to study. If you find yourself in this boat, there are things you can do to narrow down your options and have a better idea of what you want to pursue. I’ve found that the best way to see what you’re interested in is to diversify your experiences: take different types of classes, join various clubs, and volunteer at different community organizations! Getting exposure to a broad range of experiences helps you get a feel for what you really enjoy learning and what doesn’t interest you. You can narrow down your choices from there. This process of elimination was a huge part of my high school discovery process. With my classes, I quickly crossed off subjects such as biology and chemistry. While plant anatomy labeling and acid-base titrations were interesting in the class, I didn’t see myself wanting to pursue these subjects long term. I went through a similar process with clubs and extracurricular activities. During my freshman year, I tried Debate Team and my high school swim team, as well as playing flute with my local youth orchestra. Today, I’m not involved with any of those clubs. I joined because I had an interest, but ultimately found that I had to practice time management and prioritize other activities. Finding your interests is a process, and part of the process is eliminating potential subjects and activities. Take the time to explore and experience different classes and clubs, but don’t feel like you have to commit to all of them. The important thing is finding what you’re truly excited about. For me, one of those things was languages. Classes such as Spanish and Latin sparked my interest, and I am now in my Latin and Spanish clubs at school. My involvement in these clubs and my interest in languages later led me down the paths to some defining moments of my high school experience. More on that later. Outside of my school environment, I also branched out in my community in search of new experiences through volunteer work. Depending on what your community offers, some opportunities may be easier to find than others. For example, I’m from Huntsville, AL, which is known for military and technology. If you live in your state capital or DC, public policy could be your best bet to look for volunteer experiences. That said, don’t feel limited by the top industries in your area – it’s only a starting point. Like my approach to classes, I diversified my volunteer experiences and worked at our local library, an assisted living center, an elementary school, a science center for kids, a local hospital, and our local public radio station! Not only were these experiences fulfilling, but they also taught me valuable skills and experienced aspects of different careers in action, to get a sense of whether it was a fit for me. For example, I learned a lot at the hospital about nursing by accompanying nurses on their rounds, but found that I wasn’t interested in hospital work (which aligned with my earlier elimination of biology and chemistry classes!). Each of these experiences allowed me to help my community while broadening my perspectives on different career paths. Whether it’s classes, clubs, or your community, there’s always a chance there aren’t existing opportunities that neatly fit your interests. What if you don’t enjoy any of your classes? High school curriculum can be limited, and you may need to look for outside opportunities. If your school offers dual enrollment, try taking courses at a local college where you can take classes typically not offered in high school like philosophy, astronomy, and forensic science. Similarly, while you’re on college visits, take advantage of opportunities to attend the school’s offered courses and reach out to professors whose classes look interesting to you. When I visited UNC Chapel Hill, I got to sit in on a Global Politics course, where they discussed the effects and possible solutions to the Colombian Civil War. Not only can you get a glimpse of a field you may be interested in (and talk to an expert in that field), but you can also learn more about the nature of that prospective college. In the same way, if existing clubs at your school are not a good fit for your interests, start one yourself! While this may seem daunting, it is doable if you take it step-by-step. My sophomore year, in my Latin 3 class, we started discussing religious intolerance (prompted by a translation about Romans deliberating about what to do with Christians). My Latin teacher shared with us that he had always wanted to start an Interfaith Club, but never had student interest. A number of us volunteered to help start the club, and I signed up for the vice president position to move the project forward. Growing up as a non-Christian in the Bible Belt, I was always acutely aware of the presence of religion. Taking inspiration from Malala Yousafzai, who uses education as a weapon to fight injustice, I felt the Interfaith Club could be an antidote to combat religious intolerance. We started out inviting community faith leaders to come speak to the club, and over the past three years we have discussed Episcopalianism, the Baha’i faith, Hinduism, Sikhism, Islam, Judaism, 7th Day Adventism, Quakerism, and others. At first, most of our members came from our Latin 3 class, but by actively reaching out to the rest of the student community, including making flyers for meetings and school announcements on the PA system, we gradually expanded our reach to a broader school audience. We faced our share of challenges along the way: if we invited a Muslim speaker, sometimes someone would write “ISIS” and tear a flyer. When speaking with other students, they thought we were a club of conversion, instead of education. These moments were tough, but they were exactly why we needed the Interfaith club as a space to learn and promote understanding and tolerance. By persevering and holding open discussions, we started to dispel misconceptions and promote our club’s mission to learn about the diverse religions in our community and enrich our understanding of others. Today, I am overjoyed to see Interfaith as a vital part of our wide array of clubs at school. If opportunities in the fields you’re excited about aren’t available in your community, don’t be afraid to search at the national level. On the government front, state programs like Girls and Boys State and Governor’s School can put you in contact with other kids interested in policy as well as career experts. If you’re interested in research and STEM, the Siemens Foundation allows students to submit research projects for college scholarships. If learning languages is your forte, the National Security Language Initiative for Youth (NSLI-Y) scholarship might be for you. 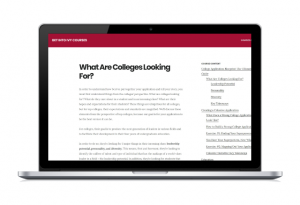 You can find these opportunities on scholarship websites like Fastweb, from your schools’ counselors and teachers, and from online resources like Get Into Ivy. When you do discover an interest you’re excited about, dive in deep! As a sophomore, I applied to NSLI-Y, a State Department funded study abroad scholarship to learn critical languages. I found the opportunity from my school’s College and Career Center and decided to apply, as I always had been surrounded and interested by languages (in school and my home environment, as my parents are from India and speak three languages). Going into the program, I expressed a tentative desire in International Relations (IR) as a major in college, but I didn’t know what I would do with that major. I was selected as a finalist to study Arabic in Jordan for six weeks in 2016. That summer truly changed my life – I was surrounded by students who primarily wanted to study IR, but they all had different aspirations. Some wanted to go into global health, others coupling IR with computer science, and others interested in the linguistic aspect. I had never spoken to students who were interested in IR, as most students in my community pursue engineering or medicine. During that summer, we had the opportunity to speak with diplomats at the US Embassy in Jordan. That was the first time I saw diplomacy as a viable career option. I felt that diplomacy combined multiple skills: public speaking, writing, information analysis, negotiation, etc. that my varied academic interests could serve me well. Combined with a love of country, culture, and languages, diplomacy just seemed to click. When I came back, I dug deep. I looked into the Foreign Service. I reached out via email to my Diplomat in Residence (DIR) to discuss his career trajectory and help me get a better idea of how to pursue that career. Per the advice of a WashU professor, I looked up other field professionals and followed their education paths. I watched State Department press briefings on their YouTube channel while doing homework to keep informed. I tapped into my NSLI-Y alumni network to participate in the Virtual Alumni Language Exchange and Digital Young Leaders exchange programs which allowed me to Skype and connect with Iraqi high school students to builds leadership and peacebuilding skills and promote cultural exchange. I then searched for the best colleges for IR. Looking back, every class I took, every club I started (or dropped), and every activity helped lead me here. By diversifying my classes and creating new extracurricular opportunities, I was able to identify my interests and set myself up for future interdisciplinary studies, and my experiences in NSLI-Y allowed me to contextualize these experiences into a potential career. At the end of the day, you don’t have to know exactly what you want to do with your life at 18. Lots of students go to college, take a class they have never been able to before, and switch majors to explore new interests. Though the short-term goal may be getting into college, it’s important to think about the long-term. Taking the time to learn more about yourself while giving back to your school and local community will help your own personal growth. And taking the time to develop interests, passions, and a sense of what excites or bores you will not only help immensely in the college process but also beyond. That’s the essential human question: What is my purpose? Exposing yourself to a wide variety of options in high school gets you a little closer to answering that. This is awesome! I’m loving the Senior Stories series. You have some very talented writers and great advice. Very impressive write up.A guidance for college aspirants. Fantastic write up! Very proud of you and I have no doubt that you will succeed in whatever you do!